Posted on Thu - Mar 20th, 2014 by NC-Culture Posted in Of Special Interest	. With 879 square miles, Bladen is the fourth largest NC county. National Register of Historic Places in Bladen County, NC. 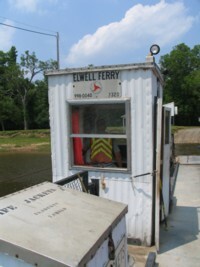 Elwell Ferry is one of three cable operated ferries still operating in NC. NC Culture recently did a newsletter post on these ferries, and you can also access that information by clicking here. Although at this time, we are having trouble with finding a current photo to use of Oakland Plantation, I did find this undated photo on Wikepedia commons. Many may remember Bladenboro for the series of animal killings, believed to have been done by the “Beast of Bladenboro“, back in the 1950s. This Wikipedia link has yet more links to multiple reports at that time. It is believed that the animal resurfaced in 2007, and rumors resumed. MonsterQuest did an expose at this time. More than fifty animals were killed in this period, between Greensboro, NC and Bolivia, NC. Every year, Bladenboro hosts the Beast of Bladenboro, NC Festival. You can follow the activities on their Facebook page. County seat for Bladen County. To visit their homepage, please see Town of Elizabethtown. One upcoming event in Elizabethtown is for August of this year. To learn more about White Lake, please visit Welcome to White Lake. To see a calendar of events for White Lake, please check the calendar. Tags: Beast of Bladenboro, Bladen County, Elizabethtown, Elwell Ferry, Jones Lake State Park, NC, Oakland Plantation, Singletary Lake State Park, White Lake	.